Uhuru Organisation International started in 2000 and since then has supported several hundred youngsters. Uhuru reaches out in particular to street children, orphans, and children experiencing extremes of gross poverty. 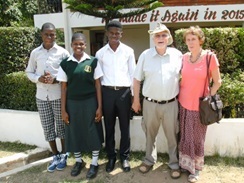 Our aim is to work with these youngsters' and any supportive family they have. Uhuru is based in Kisumu County, Kenya. This area has a very high HIV/AIDS rate, and many of our youngsters lives have been decimated due to the death of parents, aunts and uncles and in many cases they fled to the streets for a ‘better’ life. Uhuru has been supported over a number of years by SBC, a number of other churches and by many other friends. Terry Newton, the founder of Uhuru Ministries, would like to see Uhuru expand and take on more desperate youngsters. This can only be achieved by new and increased sponsorship. Currently we have 15 in university undertaking degree level courses. Where academia is not appropriate we support youngsters through craft training. 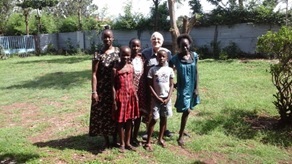 The picture above left shows Stella and some of the children. The picture above right shows Julius, Emily, Jackson, Terry and Thelma. Julius and Jackson have both completed their 1st year degree courses reading Spatial Information and Electrical Eng respectively. Emily's sister is at secondary school and needs sponsorship. If you would like to make a donation to Uhuru Ministries click here. If you would like to find out more about Uhuru Ministries' work click here.